ROCKSTAR ENERGY HUSQVARNA FACTORY RACING PODIUMS IN BOTH CLASSES AT HIGH POINT! 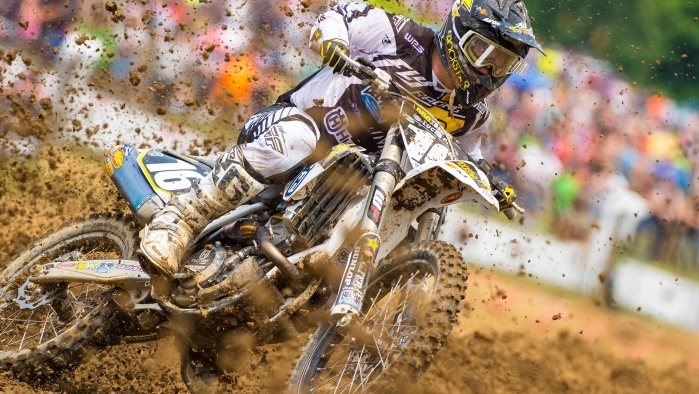 The Rockstar Energy Husqvarna Factory Racing boys had an excellent race on Saturday at the fifth round of the 2015 AMA Pro Motocross Series, held at the High Point National in Mt. Morris, Penn. Jason Anderson earned another podium in the 450 class and moved up to third overall in rider point standings. Teammate Christophe Pourcel wasn’t far behind with a fourth in the class. Zach Osborne also displayed some speed and earned second overall with an impressive ride in the 250 class. Zach Osborne’s affinity for High Point was on full display this weekend. He started in the top-10 in the first moto, quickly moved into the fifth-place position and continued to charge ahead. He made the pass for fourth with 21 minutes to go, before eventually settling into the fifth-place position where he finished. He came back with a vengeance in the second moto by coming out of the gate perfectly and pulling the holeshot aboard his Husqvarna FC 250. He fell back to the second-place position after a slight bobble, but still charged ahead and kept himself toward the front of the pack for the remainder of the race before finishing second. The 5-2 finish gave him second overall and maintained his position at sixth overall in 250 rider point standings. Christophe Pourcel started the day strong by earning the fastest qualifying time in the class. In the first moto, Pourcel pulled a top three start aboard his Husqvarna FC 450 and immediately started battling for the lead. After going back and forth for the position, he navigated to the front of the pack by the end of the first lap before settling in second. Meanwhile teammate Jason Anderson, who was seventh in the second lap, set his sights on moving up the ranks. He rocketed up to fourth by lap eight, while Pourcel moved back to third before attempting a late charge for the second-place spot. Pourcel finished third, his best finish so far, and Anderson came in right behind him in fourth. Pourcel pulled a huge holeshot in the second moto before moving back to the fifth-place spot where he finished. The 3-5 finish gave him fourth overall, and put him at ninth overall in rider point standings. Anderson got a top-10 start and moved to fourth by the third lap, with his sights set on the podium. He made the pass for third the next lap and held strong to the finish. His 4-3 finish earned him third overall on the day, and moved him from sixth to third overall in 450 rider point standings. Rockstar Energy Husqvarna Factory Supported Ryan Sipes earned 12th overall. “I didn’t realize how much energy last weekend took out of me,” said Sipes. “I was tired from the get-go. I didn’t have the snap—that extra 5% of energy to throw down a heater or really push in a section. I did my best. I stayed on the bike for the most part. 13-13—I’ll take it. I’m not as pumped as I was last week but it’ll do. The riders will now take a week off before making their way to the Budds Creek National on June 27, held at Budds Creek Motocross in Mechanicsville, Md.